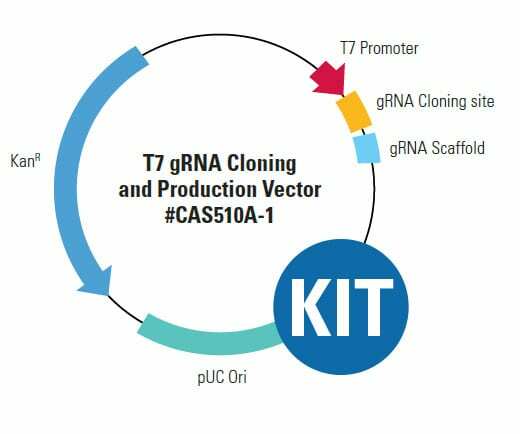 The T7 gRNA SmartNuclease™ Synthesis Kit has everything you need to synthesize a custom gRNA—just ligate your gRNA sequence into the included T7 gRNA SmartNuclease Cloning and Production Vector, and then transcribe with the included T7 in vitro transcription reagents. The selection of the target DNA sequence is not limited by any constraints, with exception of the requirement of a PAM sequence in the form of 5’ – NGG – 3’ (where N = any base) immediately following the target sequence. The typical length of the target sequence is 20 bp. Figure 1. gRNA cloned-into and synthesized using the T7 gRNA SmartNuclease Cloning and Production Vector directs rescue of a non-fluorescent eGFP mutant using Purified Cas9 Protein. Rescue of non-fluorescent eGFP mutant (EGIP) via homology-directed repair using either a Cas9 All-in-one plasmid system (left panel) or a Cas9 protein-gRNA system (right panel), three days post-transfection. Direct transfection of Cas9 protein-gRNA results in a higher rescue efficiency.